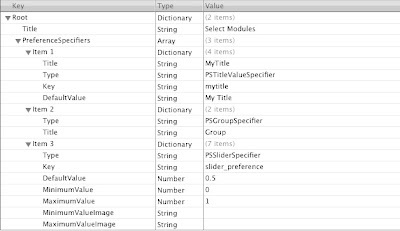 In this post I will be using PSChildPaneSpecifier in the application preferences. 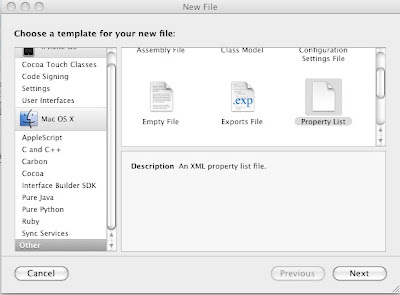 You should read part 1 of this post if you are not familiar with application preferences. You can find it here . What does PSChildPaneSpecifier do? It adds another page of configurations into your settings. We do that when we have a large number of configurations, so we divide them into categories and make a child pane of each category. Name the file as "Child.plist". You will notice that child.plist file is not added in the Settings.bundle. You need to add it inside Settings.bundle which will be done from the terminal. Now copy child.plist file into the Settings.bundle by following command: "cp child.plist Settings.bundle". Cross verify by navigating into Settings.bundle directory and executing "ls". child.plist file should show up. 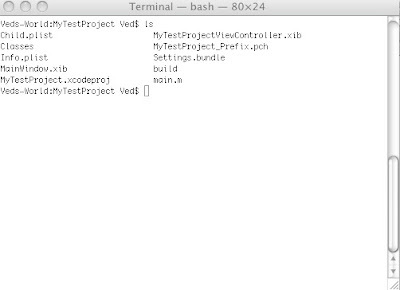 We have created the new child plist file, now we need to add a reference to it in the root.plist file. Open root.plist and add 2 new items to make it look like this. In next post I am going to access these preferences from the MyTestProject and also allow the user to change them from the View itself. where is the referred next posting. I could really use it. Just wondering when the next posting will be? This is the part I am really stuck on!